This is the catalogue of an exhibition mounted by the Bibliotheca Philosophica Hermetica in Amsterdam, to coincide with the Amsterdam Summer University’s 1994 courses “Gnosis and Hermeticism from Antiquity to Modern Times” and “Symbolism in Art: in search of a definition.” The fifty-eight items are illustrated, each with a commentary by McLean. The founder of the library, J.R. Ritman, and its Director, F.A. Janssen, contribute essays, in addition to McLean’s introduction. Like all the library’s productions, the volume is beautifully produced, printed, and illustrated. As the necessary complement to Mr. Ritman’s visionary preface, Professor Janssen takes a scholar’s and bibliographer’s approach to the material in the exhibition. He focuses on the people responsible for publishing the glorious Hermetic images of the early seventeenth century (Lucas Jennis, Johann Theodor de Bry, and Mattheus Merian), and on the question of who actually designed those images. Since the engravings in the books of Maier, Fludd and Gichtel are such integral parts of their teaching, it seem obvious, says Janssen, that the authors passed their ideas to the publishers, who in turn instructed the engravers. In the care of Merian, who, “as is evidenced by his correspondence, was a follower of the spiritualists Schwenckfeld and Weigel,” he could have invented some of the imagery himself. Adam McLean has already edited for the library The Three Mystical Tables of Dionysius Andreae Freher (Amsterdam: In de Pelikaan, 1994, 112 pages, ISBN Amazon Abebooks Powell's, £15). His introduction and commentaries in the present catalogue are a perfect example of scholarship informed and inspired by a profound involvement with the Hermetic path. He starts by defining the currents of the time from which the majority of these symbols came: the time when the “new synthesis of hermetic and alchemical ideas which has become known as Rosicrucianism” coincided with Jacob Boehme’s “internally consistent new mysticism which fused hermeticism, alchemy, and Christianity into a coherent and beautifully structured spiritual philosophy.” As important forerunners he mentions the system of Ramon Lull and the early Renaissance interest in symbolism that produced the Hypnerotomachia Poliphili, the revival of hieroglyphs, and the emblem books. As successors, he points to the eighteenth-century Hermetic revival in France and the Russian revival that closely followed it. 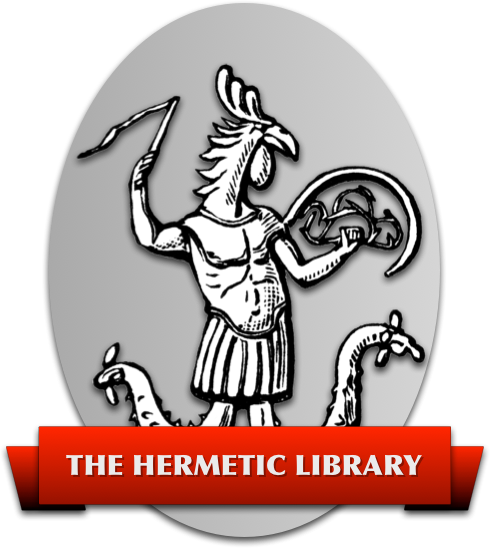 (In 1993 the Bibliotheca Philosophica Hermetica organized an exhibition in Russia, entitled “500 years of Gnosis in Europe,” which unearthed hitherto unknown evidence of Russian Hermeticism.) By that time, symbolism had received new energy through its use in Freemasonry, leading to the synthesis that forms the culminating exhibit of this catalogue, Geheime Figuren der Rosenkreuzer (2 parts, 1785, 1788). The exhibition itself was imaginatively displayed in cases spread throughout the library, which occupies a pair of houses on Amsterdam’s Bloemstraat 15-19. Thus the items on show had as their background thousands of books on Hermeticism, alchemy, mysticism, and Rosicrucianism, as well as the presiding busts of Cosimo and Lorenzo de’ Medici and a number of Hermetic paintings, ancient and modern. The centerpiece was a fully-assembled copy of the Carte Philosophique et mathématique (1775) of Théodore du Chenteau, which is a much expanded version of the so-called Magical Calendar of Tycho-Brahe (1620). Another highlight was the watercolor recreation of the Geheime Figuren made in 1943 (also reproduced on the back cover of Gnosis Magazine, no. 1). The earliest item chosen for the exhibition was an incunabulum, Heinrich Suso’s Buch genannt Seuse (1482), opened to display the figure of the crucified Christ surrounded by red roses. In between was a discriminating selection of symbols from emblem books, the Paracelsians, the Rosicrucian period, Boehme and his followers, the German heart-mystics, and alchemists of the period ironically known as Aufklärung or Lumières. McLean has valuable comments to make on all of these, though without unfurling their symbolism as thoroughly as he has done, for example, in his Alchemical Mandala (Grand Rapids: Phanes Press, 1989). The catalogue could be seen as a complementary work to the latter, containing much more factual, historical, and bibliographic information. It also contains some extremely rare illustrations, taken from books scarcely known even to specialists. Hermeticism apart, it is fascinating to look through the catalogue from an art-historical point of view, seeing how the symbols are presented in a variety of techniques and styles. There are also a number of sub-planes, as, for example, the Alchemical. This plane will often appear in the practice of “Rising on the Planes”; its images are usually those of gardens curiously kept, mountains furnished with peculiar symbols, hieroglyphic animals, or such figures as that of the “Hermetic Arcanum,” and pictures like the “Goldseekers” and the “Massacre of the Innocents” of Basic Valentine. There is a unique quality about the Alchemical Plane which renders its images immediately recognisable. That was Aleister Crowley (Magick in Theory and Practice, New York: Castle Books, n.d., p. 150. ), whose books will not be found in the Bibliotheca Philosophica Hermetica, but who in this instance probably knew what he was talking about. For those of us who cannot or would rather not “rise in the planes,” the symbolic world of Hermetic philosophy still affords a unique combination of visual pleasure and spiritual meaning.